The first Habitat for Humanity volunteer opportunity of the school year will be Sept. 21. 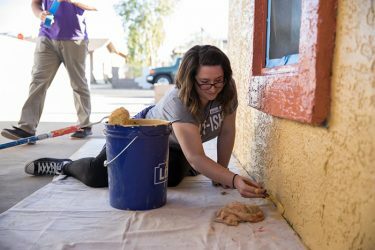 Grand Canyon University‘s Canyon Corridor partnership with Habitat for Humanity is nearing completion of its 200th home, but the help of GCU employees is needed to reach that goal. Cassandra Jarles, Habitat’s Director of Sponsor Relations, said the partnership has served 190 families in the corridor and in the Maryvale neighborhood since January 2015, on pace to reach 200 by the Oct. 27 Serve the City date. 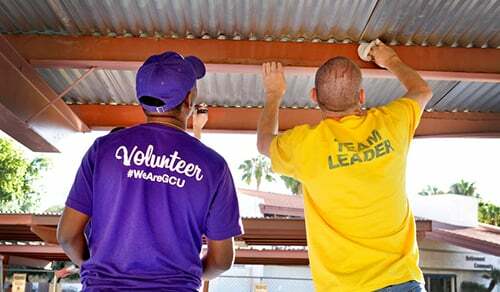 To make it there, GCU and Habitat will need employee volunteers to continue proving their dedication to the community. Jarles said the Canyon Corridor connection with GCU was the first neighborhood revitalization project Habitat took on. Since inception, the partnership has provided more than $1.4 million in home repairs and more than 3,100 employees have volunteered. There are many different tasks to do in Habitat projects, and many of them don’t require physical strength. “Our partnership with Habitat for Humanity is the largest of its kind in the country, but what makes it even more significant is that it directly connects us with the neighbors around us. We don’t want to build this brand new campus and just isolate it from the rest of the community,” GCU President Brian Mueller said. Jarles said Habitat’s partnership with GCU has opened the door to helping other surrounding communities outside the corridor, such as Maryvale. She said the impact GCU is making on the community has built more relationships among neighbors. The revitalization has intertwined the University with the corridor, Jarles said. 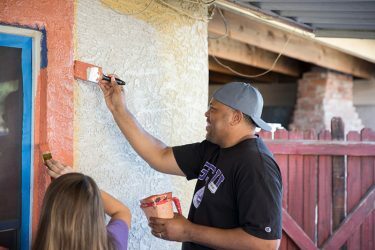 Debbie Accomazzo, GCU’s Community Outreach Manager, said the University has many outstanding relationships, but the one with Habitat is perhaps the best example of combining resources. “You’re going to get dirty and you’re going to love every minute of it,” she said. Volunteer dates are listed a semester at a time. The first employee date in the fall is Sept 21. Departments are encouraged to sign up together, and Accomazzo said she and Jarles are happy to meet any special requests.